Reputation management is an essential part of an effective social media strategy. Since its launch in late 2013, Facebook Reviews has quickly become one of the most popular ways for consumers to leave direct, public feedback for brands. What’s more, nearly 66% of consumers who want to share their experiences, thoughts and opinions are most likely to do so on Facebook. Today, in order to help brands gather and acknowledge this valuable customer feedback, we’re excited to announce that you can manage your Facebook Reviews from Sprout. Whether you manage one Page or many, you can seamlessly continue the social conversation by monitoring and engaging with ratings and written reviews alongside all other incoming messages in the Smart Inbox. Within the Smart Inbox, Facebook Reviews surface the numerical rating as well as the written review left on your Page(s). In addition, comments and comment replies on Facebook Reviews have been added to the existing Comments message filter within the Smart Inbox. 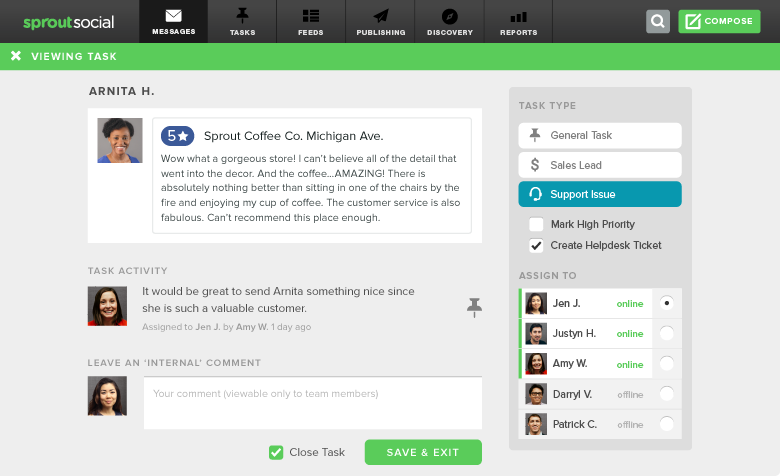 Users can continue to leverage Sprout’s engagement toolset to better manage their online reputation—including replying, tasking, tagging and marking messages complete. With collaborative tools and intuitive workflows, your team can increase productivity, escalate issues tied to negative Facebook Reviews and create tasks for efficient follow-up. Keep in mind, Facebook Reviews are only available for businesses that list a physical address on their Page. Reviews can be enabled and disabled by a Facebook Page Admin by visiting Page Settings > General and selecting the Reviews section on Facebook.com. Local businesses rely on Facebook Reviews to raise brand awareness, drive traffic to their stores and ultimately build customer relationships. 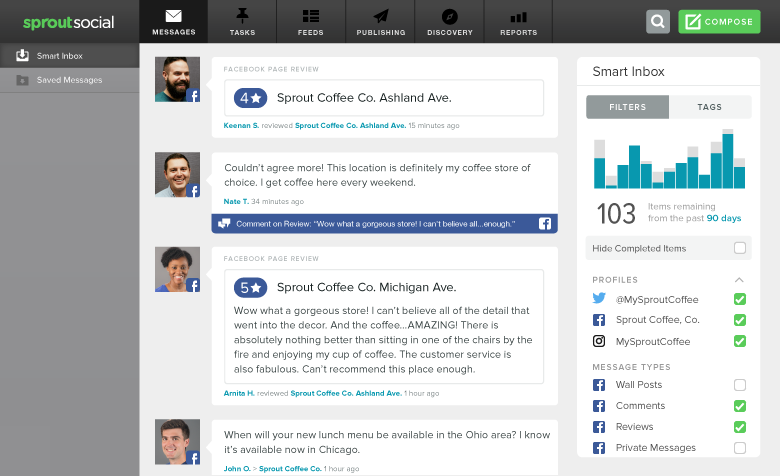 The Smart Inbox brings reviews across multiple location Pages into a single, filterable stream. For businesses that operate more than one brick-and-mortar location, a unified inbox saves time by enabling teams to monitor and engage more productively. When managing multiple location Pages across a team, the flexibility of the Smart Inbox makes it easy to divvy up the workload and keep each team member focused on what they are responsible for monitoring and managing. Simply click on a specific Page name in the Profiles list to isolate messages specific to that Page. Use the View By Type toggle to focus on Reviews. Facebook Reviews are just one of many customer touch points along a customer’s path to purchase. In order to better understand the customer journey it’s important to consider previous comments, Wall Posts and Private Messages from a Facebook user. These past interactions provide powerful context that can shed a light on what led to a particular rating or review. 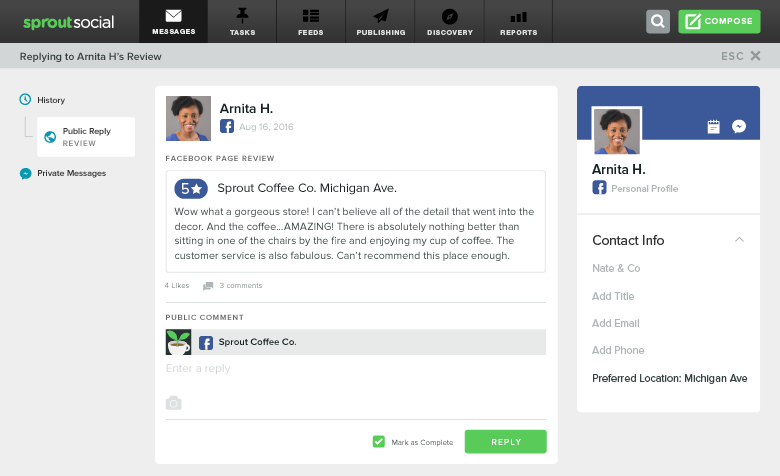 Sprout’s Contact View lets Sprout users easily access this message history when engaging with a Facebook Review. In addition, social CRM tools like contact details and notes lead to more informed and personalized responses creating an overall better customer experience. Whether you are managing one Facebook Page or one hundred, Facebook Reviews in your Smart Inbox enable you to continue the social conversation with your customers. 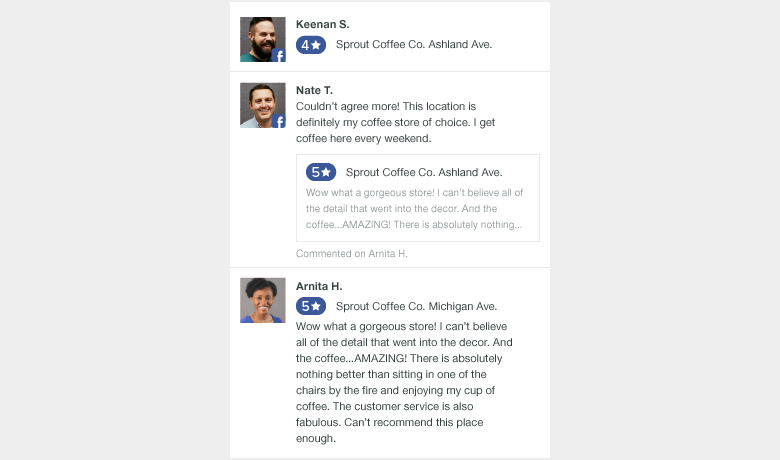 You can also easily address Facebook Reviews that require a timely response on the go with full support in Sprout’s mobile apps. When customer reviews can happen anytime, responding to and acknowledging this feedback is pivotal to maintaining strong customer relationships. Stay tuned for more updates to the Smart Inbox.